Cedar Rapids Souvenir Box. Design by Sally Milo - MiloDesign. Sold in "As Is - As Found" condition. MCKEEVER QUADRANGLE. U.S.G.S. TOPOGRAPHICAL MAP. Partly Within Adirondack Park. Portions of the towns of:Greig, Webb, Lyonsdale, Ohio, Forestport. Circa 1947. A rather scarce map. Published: Philadelphia, O. W. Gray & Sons Circa 1867. Circa 1867. Published: Philadelphia, O. W. Gray & Sons. Antique Map of. 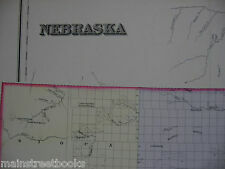 th century hand-colored map ofNebraska. By Frank Gray. Amount of Rain Fall. Map of United States. Circa 1860. Published: Philadelphia, O. W. Gray & Sons. By Lorin Blodget. Rex Furniture Co. / Reseda, CA and Burbank, CA / 1952 Encased Cent, Good Luck, Advertising Token / Uncirculated Details / A Super Nice Reseda and Burbank Collectible at a Fair Price. 1946 U.S.G.S. TOPOGRAPHICAL MAP OF COLRAIN, MASSACHUSETTS & SOUTHERN VERMONT. Folded twice (as issued); lightly tanned, very faint crease at one corner, else very good, crisp condition. Verso prints a history of the U.S.G.S. topographical map program, and a pictorial legend of standard symbols. Folded twice (as issued); very light wear, else in crisp and clean condition. 1946 U.S.G.S. TOPOGRAPHICAL MAP. Folded twice (as issued); very light wear at extremities, else in very good, crisp and clean condition. Folded twice (as issued); very good condition-- crisp and clean. Folded twice (as issued); very light wear at extremities, else in very good, crisp and clean condition. 1948 U.S.G.S. TOPOGRAPHICAL MAP. Portions of the towns ofSouthington, Berlin, New Britain, Farmington, etc. TOPOGRAPHICAL MAP. New Britain, Connecticut. A rather scarce map. U.S.G.S. TOPOGRAPHICAL MAP. Map shows portions of the towns of:Enfield, East Windsor. A rather scarce map, it will make a nice gift or addition to your collection. Folded twice (as issued); very good, crisp condition. 1948 U.S.G.S. TOPOGRAPHICAL MAP OF HANCOCK, MASSACHUSETTS. 1951 U.S.G.S. TOPOGRAPHICAL MAP OF TISBURY GREAT POND, MASSACHUSETTS. Folded twice (as issued); neatly folded along one margin, few pinholes, light wear, else very good, crisp, clean condition. Both are in near fine condition. Vaux' Restaurant Deluxe / Balboa, California / 1947 Encased Cent (Original to the Piece) / Balboa is Next to Newport Beach / Problem Free Condition / Nice 70 Year Old Orange County Collectible / Very Scarce Item. Mt. Chocorua Quadrangle. TOPOGRAPHICAL MAP. A rather scarce map. FRANCONIA NH Quadrangle 1948 TOPOGRAPHICAL MAP Franconia Notch Big Coolidge Mtn. Very nice map showing lakes, ponds, rivers, nearby mountains, within the Franconia Quadrangle, to include:Haystack Mtn., Eagle Cliff, Gale River, Franconia Notch, Pemigewasset River, Loggin R.R., Big Coolidge Mtn. Historic RareBenton County West Richland Wa. Has 2 small hole Punchon the left side from an old binding. U.S.G.S. TOPOGRAPHICAL MAP OF PLAINFIELD, VERMONT AND SURROUNDING TOWNS. Folded twice (as issued). Just the slightest wear and dust soiling to extremities, else very good, crisp, clean condition. SANTANONI QUADRANGLE. U.S.G.S. TOPOGRAPHICAL MAP. Entirely Within Adirondack Park. Circa 1947. A rather scarce map. Portions of the towns of:Harrietstown, North Elba, Newcomb. U.S.G.S. TOPOGRAPHICAL MAP OF HANOVER, VERMONT AND SURROUNDING TOWNS. Folded twice (as issued). Just the slightest wear and dust soiling to extremities, else very good, crisp, clean condition. To a "Sharp" Friend of / Owl Bar / Bud & Mary Ann Jones / Thermopolis, Wyoming / Antique Advertising Whetsone / Rare Wyoming Collectible as I am Certain Very Few if Any Survived the Years / Nice Token Go-With. Blue Motor Coach Lines / Listed in Token Catalog as being from Louisville, Kentucky \ School Check / Antique, Brass, Transportation Token / Nice Looking Token and a Perfect Louisville Collectible. U.S.G.S. TOPOGRAPHICAL MAP OF HARDWICK, VERMONT AND SURROUNDING TOWNS. Folded twice (as issued). Just the slightest wear and dust soiling to extremities, else very good, crisp, clean condition.